In January 2017, the members of the bluegrass group Dailey & Vincent found themselves being told what all country artists dream of hearing…the Grand Ole Opry would like them to join as members. Opry member Marty Stuart came out on stage to surprise the band with the happy news, which prompted an emotional response. They were later inducted by Old Crow Medicine Show and Jeannie Seely in March 2017. Since then, Dailey & Vincent have maintained their commitment to the Opry by remaining one of its most frequently scheduled performers. 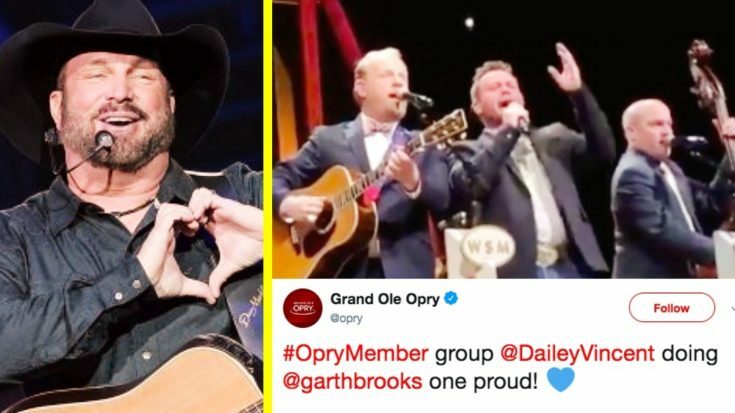 They just stopped by the Opry house on Tuesday night (March 26), and while there they decided to honor another one of their fellow Opry members, Garth Brooks. The group opted to perform their own take on one of Brooks’ all-time biggest hits, 1994’s “Callin’ Baton Rouge.” It was originally recorded by the Oak Ridge Boys, but Brooks’ Top Ten-ranking rendition is the most well-known today. Brooks has said many times before that “Callin’ Baton Rouge” is one of his favorite songs to perform live, all because the crowd gets super hyped up when he sings it. Radio station KORD 102.7 cites Brooks as saying that it’s a good workout for him to perform the song in front of a live audience! If you’ve ever seen Brooks sing “Callin’ Baton Rouge” live, then you know exactly what he means by that. It gets those toes tappin’ like no other song out there. So you can imagine how intense the energy was at the Opry when Dailey & Vincent dusted off the song during their set. The group gave the tune a bit of a bluegrass twist, making it their own while still bringing the same sense of energy to it as Brooks did years ago. The Opry thankfully filmed the performance, and shared a piece of it on its official Twitter. While it’s only a 30 second clip, it’s more than enough to let you know just how extraordinary Dailey & Vincent’s rendition of the song is. You can go ahead and watch the bluegrass band honor their fellow Opry member by tuning in to their performance of “Callin’ Baton Rouge” below. Just imagine if they joined Brooks to sing this song sometime…that would be an epic thing to see and hear!